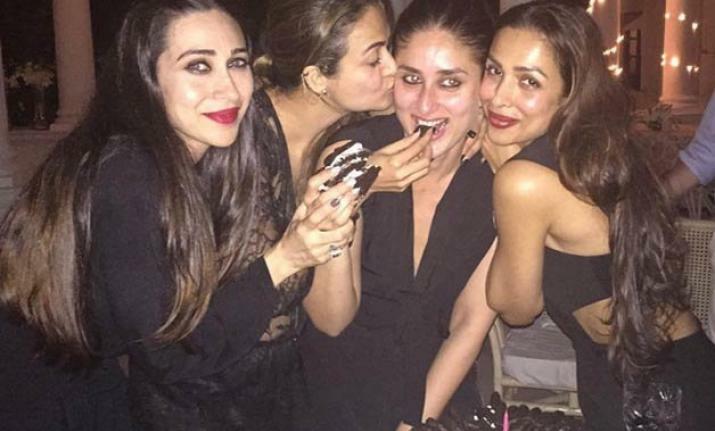 Kareena Kapoor Khan turns 38 on September 21 and she celebrated the big day with her close friends and family with a spectacular midnight bash. Pictures from the do, which was attended by Kareena’s sister Karisma Kapoor, mother Babita, dad Randhir Kapoor and of course, husband Saif Ali Khan, have been shared online. Karisma posed for a pic with the birthday girl and their mother and shared it on her official Instagram account. “Family fun,” she captioned it, and added the hashtags, birthdaygirl, bebo, ourrockstar lafamilia. In the picture, Babita can be seen standing in between, lovingly holding her daughters’ faces in her hands. Karisma also posted a couple of more pictures a selfie with dad, Randhir, and a group picture. In another picture, this one shared by Saif’s sister, Soha Ali Khan, who came along with her husband Kunal Kemmu, the entire group can be seen posing together around a birthday cake with flares for sparkler candles. Wearing bright party hats and with balloons in the background, everyone seems to be having a grand old time.